Apply now for the NYS Excelsior Scholarship that provides free college tuition at public colleges and universities for eligible students. 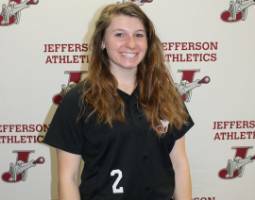 Sophomore outfielder/shortstop, Samantha J. Dibble, of the Jefferson Community College (JCC) softball team was named JCC athlete of the week for the week ending April 14, 2019. JCC's athlete of the week program is sponsored by Victory Promotions and Under Armour. 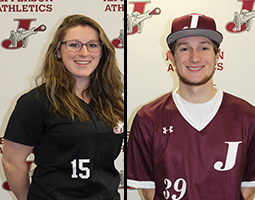 Sophomore outfielder, Katelyn I. VanBrocklin of the Jefferson Community College (JCC) softball team, and sophomore outfielder, Jason H. Kavanaugh, of the Jefferson baseball team, were named JCC co-athletes of the week for the week ending April 7, 2019. JCC's athlete of the week program is sponsored by Under Armour and Victory Promotions. The humanities department at Jefferson Community College will host "Should We Believe?," a religious debate between a theist (a believer) and a non-theist on Thursday, April 25, 2019, at 6:30 p.m. in Room 6-002, Jules Center (building 6). Earning college credits during the summer months is a breeze at Jefferson Community College (JCC)! 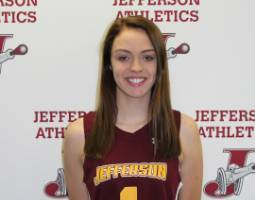 Freshman midfielder, Natalie A. Cole, of the Jefferson Community College (JCC) women's lacrosse team was named JCC athlete of the week for the week ending March 31, 2019. JCC's athlete of the week program is sponsored by Victory Promotions and Under Armour.